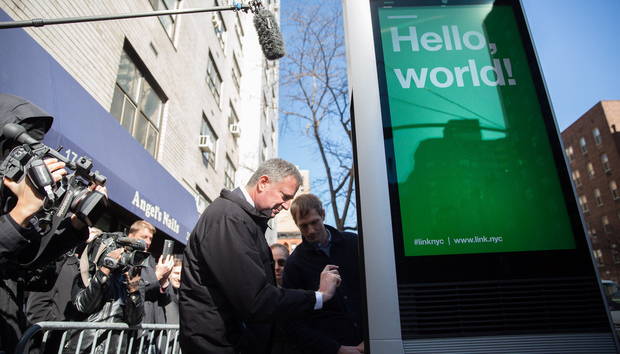 New York City on Thursday officially launched its payphone booth replacements: shiny new 9-foot-plus-high kiosks dubbed Links that offer free Gigabit-speed Wi-Fi as well as free domestic VoIP calls via a tablet app. Mayor Bill de Blasio, joined by vendor partners such as Qualcomm and NYC Department of IT and Telecommunications reps, showed off the first operating LinkNYC kiosks, just over a dozen of which are spread across 3rd Avenue for starters (see map). The spacing of the hotspots will enable users to stay connected as they walk down the street. More than 500 Links are slated to be operational by mid-year, across all five boroughs, including neighborhoods such as St. George on Staten Island, Jamaica in Queens and Flatbush Avenue in Brooklyn. More than 4,500 kiosks are scheduled to be installed over the next four years. Overall, at least 7,500 Links are planned for installation, supported by a $200 million high-speed fiber network funded t by NYC's CityBridge partners. The kiosks, in addition to supporting encrypted Wi-Fi connectivity for hundreds of HotSpot 2.0-enabled devices within 150 feet of them, will each include two USB charging ports, a red 911 button to contact emergency services and a weather- and vandalism-proof Android tablet that can be used to access information about the city and allow for free phone calls via Vonage. Opt-in Bluetooth-based location services will also be offered, as will apps for web browsing, maps, etc. Network services are free to users, as the system is supported via advertising that is projected by the organization to generate hundreds of millions of dollars for the city. In fact, that advertising play has some observers keeping a close eye on whether users' privacy will be compromised, even though the city insists that no personally identifiable information will be shared outside of CityBridge. LinkNYC also has shared tips for connecting to its network securely.